The Fat Prophets Global Property Fund (the Fund) outperformed its benchmark in January although recorded a decline in NTA, impacted meaningfully by a weaker Australian Dollar relative to the US dollar which breached AUDUSD 80c in late January. There were also declines in various global REIT names in January as investors weighed on higher bond rates. FPP’s portfolio has no currency hedging in place, in line with stated strategy. Overall the Benchmark REIT Index has declined 5.4% over the past two months while the Fund’s NTA has declined by 2.4% over the same period. While the Fund’s NTA declined 2.9% during January, it meaningfully outperformed its benchmark index which declined 4.12% during the same period. As such, the Fund outperformed its benchmark by 1.22% or 122 basis points over the month. 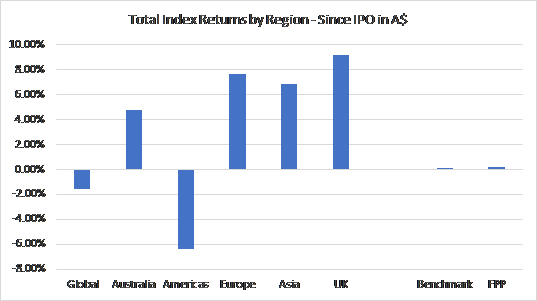 Since the Fund’s IPO in October 2017, markets have been positive with the exception of the US market (impacted in part by the weakness in the Australian dollar relative to the US dollar). We anticipate that February will see the Fund neutralise its underweight allocation to the US market which it has maintained since IPO in October. There were relatively few investments held by the Fund in January which traded ex distribution and the Fund’s realised distributions increased marginally. The Investment Manager continues to be focussed on building the distribution reserve for payment to Fund investors at the end of FY18. As is typical of this time of the year, there were no takeover announcements during January which impacted the Fund. There are a number of active positions held by the Fund however, where the Investment Manager expects positive risk of takeover to support share prices and potentially result in excess returns. The cash levels in the Fund were increased during January in anticipation of negating some of the US market underweighting in the Fund. Thematically, the Fund remains invested strongly in shopping centre REITs and storage REITs in global markets. Regionally, the Fund ended January with an underweight position to the US, overweight to Australia and underweight to Hong Kong. Exposure in Japan was also reduced during the month after strength in positions owned by the Fund in the region. These investment liquidations left the Fund in an attractively high cash position towards the end of the month, leading into weakening markets. The Fund continues to hold around 50 investment positions. 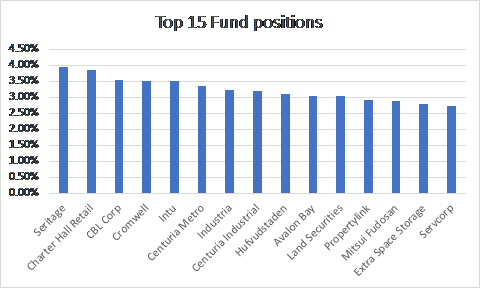 The top 15 positions are highlighted in the following chart and continue to demonstrate an overweight to shopping centre REITs. The largest position which was 5% at the end of December is now slightly less than 4% at the end of January. The top positions reflect a diversified mix of investments across US, Australia, Europe and UK. GDI Property Group (Australia) was sold at a profit in a weak Australian market, crystallising profit. Aveo Group (Australia) was also sold after recording an 8.6% positive return reflecting a rebound in the retirement village owner’s standing in the market. However, we are wary of owning the stock into reporting season given the negative press regarding business practices during 2017. The balance of the Fund’s short term trading investment in Ingenia Communities (Australia) was sold after a small gain as it doesn’t fit with the Fund’s core long term strategy of owing REITs below NTA. GLP JREIT (Japan) performed strongly with a double digit return pre currency which was reduced slightly with the weakening of the Australian dollar. Japan Hotels (Japan) was an investment made for its December distribution which reflected an annual 5% yield. The Fund sold out of the position after the distribution was rapidly fully recovered in the share price. An investment in Secure Income REIT in the US was initiated in late January prior to it paying a distribution, benefitting the Fund. The effect of the trades made during January resulted in reducing the Fund’s overweight to Australia, reducing the Fund’s US market underweighting, and moving from an overweight to an underweight position in Japan. It also increased the cash holdings in the Fund to 10% into the end of the month which has proved fortuitous as equity markets dived in early February. Moving into February the Investment Manager will be actively managing the portfolio to take advantage of volatility and mispricing opportunities as well as anticipating using the recent currency movements to the Funds advantage. [i] Fat Prophets Funds Management Pty Limited (FPFM) (ACN 615 545 536) has prepared the information in this announcement. One Managed Investment Funds Limited (ACN 117 400 987) (AFSL 297042) (OMIFL) is the Responsible Entity of the Fund. While OMIFL has no reason to believe that the information is inaccurate, the truth or accuracy of the information in this document cannot be warranted or guaranteed by OMIFL. This announcement has been prepared for the purposes of providing general information only and does not constitute an offer, solicitation or recommendation with respect to the purchase or sale of any units in the Fund nor does it constitution financial product advice and does not take into account your investment objectives, tax or financial situation or needs. Anyone receiving this information must obtain and rely upon their own independent advice and enquiries. Investors should consider the Product Disclosure Statement (PDS) issued by OMIFL before making any decision regarding the Fund. 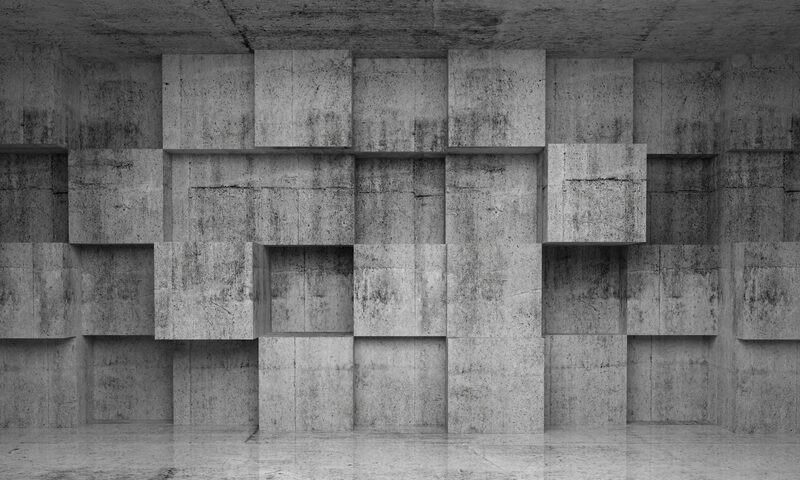 The PDS contains important information about investing in the Fund and it is important investors obtain and read a copy of the PDS before making a decision about whether to acquire, continue to hold or dispose of units in the Fund. You should also consult a licensed financial adviser before making an investment decision in relation to the Fund. Past performance is not indicative of future performance.